Southeast Belmont’s newest sushi restaurant combines Northwest style and ingredients with Japanese techniques and flavors—right down to the beer on tap. Cody Auger and Eric Boor’s new sushi restaurant, tucked into the Belmont Garage that’s also home to Slappy Cakes, The People’s Yoga, and Chocolab, opened its doors this week to neighborhood sushi lovers and locavores alike. 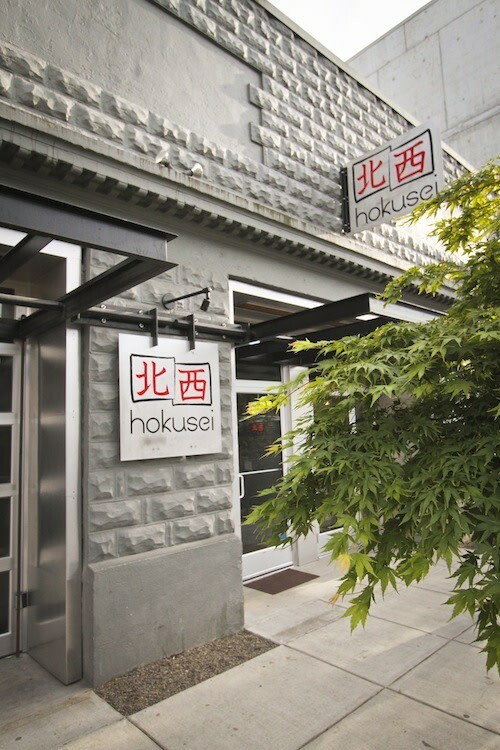 The 47-seat Hokusei—pronounced ho-ku-say, meaning Northwest in Japanese—combines sleek and modern sushi style with the elements of design and service familiar to any Portland food fanatic, down to the hand-crafted reclaimed wood details, garage door windows, communal tables, exposed edison lightbulbs, and tattooed servers. 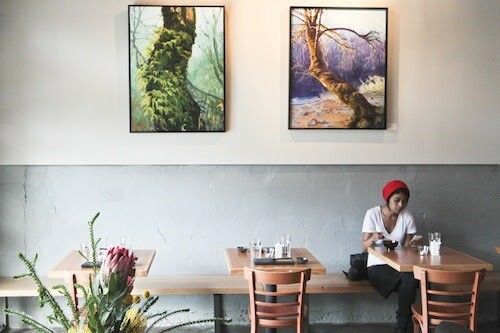 The large paintings of mossy forests and misty mountains might be inspired by the greenspaces of Oregon or Okinawa, and even the beer on tap—Double Mountain Vaporizer, Rogue Morimoto Soba Ale, and Asahi—is a mash-up of East-meets-Northwest favorites. Executive Chef Kaoru Ishii (formerly of Malibu’s Nobu and Beverly Hill’s Matsuhisa) prides himself in sourcing hard-to-find seafood for his simple but elegant nigiri and sashimi, from sweet young hamachi and salt-water eels to untra-fresh uni and bright Kampachi (the "designer yellowtail" bred in Kona currently in vogue with sustainable fish insiders). 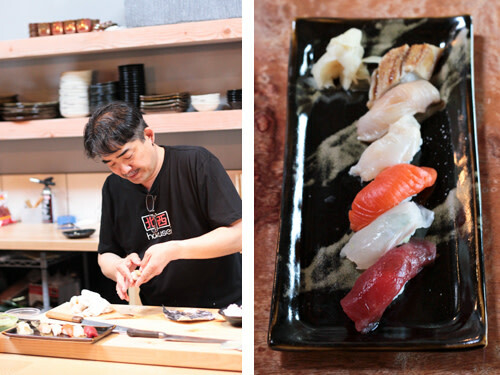 Nigiri are available by the piece ($.50-$3) and the six, ten, and twenty-piece omakase (chef’s choice) sushi plates are a great deal for seasoned sushi lovers and novices alike. Vegetarians will find much to love as well, with four vegetable rolls including the "Beet It" featuring grilled asparagus, creamy avocado, and crisp cucumber topped with extra-thin slices of roasted beets for a gorgeous fish-free version of a rainbow roll. 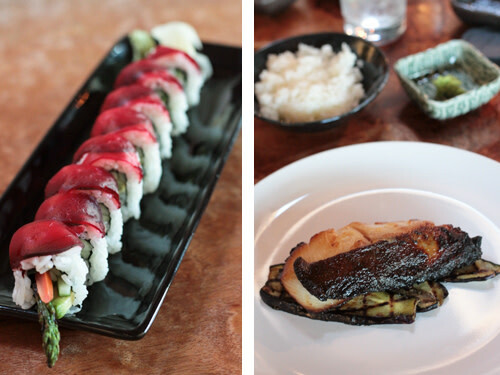 The “Beet It” roll and miso-marinated black cod at Hokusei. The Pacific Northwest influence is best expressed in the small-but-mighty selection of dinner entrees featuring local ingredients and Japanese flavors. The stand-out on opening night was the savory miso-marinated black cod over delicately grilled Japanese eggplant, served piping hot with sweet and crispy skin and a side of sushi rice. 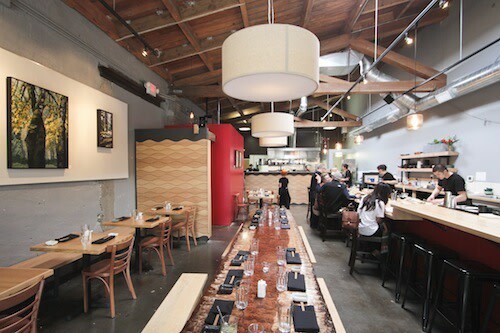 The menu also offers Kurobuta Pork shoulder with kabocha squash puree and seared bok choy and grilled Painted Hills tenderloin with root vegetable puree and shiitake mushrooms, dishes that would be at home in any Asian-inspired Portland hot spot. Want to try out the new spot on the cheap? Stop in for Happy Hour (Wednesday through Sunday 4 to 6 pm and all day Monday) for buy two, get one free nigiri and rolls, $5 cocktails, and $4 beers.